Deborah Madison’s Apple Crisp | One Picture, A Million Words. 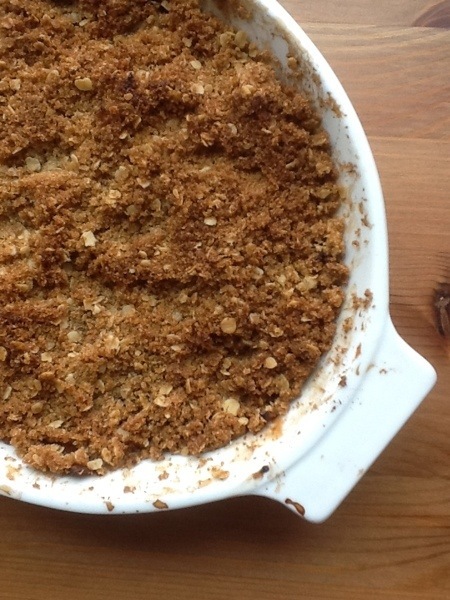 My favourite way to make bad fruit edible is to add a crumble or crisp topping over it. Of course, if you had used great tasting fruit then your crumble or crisp will be all the better. But seriously, do not throw away those rock hard peaches, tarter than tart berries, mealy apricots and pears or bland tasting apples that you’d gotten from the supermarket and duly regretted. Turn them into a healthy treat and possibly the best breakfast ever. I like making a crumble for dessert but in truth, I’m always hoping for leftovers because there is nothing better than having a giant scoop of fruit crumble – cold from the fridge, no need to reheat – with plenty of plain yogurt for breakfast. The recipe for this apple crisp comes from Deborah Madison’s book, Vegetarian Cooking For Everyone, one of my favourite and frequently used cookbooks. Being in a healthy mood when I made it, I went for the variation using oil instead of butter. There is a difference in taste between a butter based and an oil based topping, but I wouldn’t necessarily say one is better than the other. It really is a matter of personal choice. To make a crumble or crisp a healthier dessert or breakfast, I like to use as little sugar as possible without compromising the taste. Despite what the recipe says, a packed quarter cup of brown sugar for the topping provides the right amount of sweetness for me. I do not usually add sugar to the fruit part unless I know I am dealing with really sour fruit. I also prefer a bigger ratio of oats to flour and use a whole grain variety of flour. My daughter used to love eating only the crumble topping and would touch none of the fruit. These days she is the opposite. Perhaps one day she will eat everything. Or maybe she will not eat it ever again. Such is the capricious nature of children.